Waheguru Ji Ka Khalsa Waheguru Ji Ki Fateh. Hukamnama today is on Ang 611 of Sri Guru Granth Sahib Ji Maharaj by Sri Guru Arjan Dev Ji Maharaj. Guru Pi-aaree SaaDh sangat jio, Satguru Arjan Dev Ji is speaking to us in Sorath Raagini today. khojat khojat khoj beechaari-o raam naam tat saaraa. Guru Ji begins the shabad with khojat khojat khoj beechaari-o I have searched the scriptures throughout the world, I have searched in all the four corners of the world, I have searched within all countries, within all states, in all four corners, in all religious scriptures, in all religious understandings, beechaari-o - and I have come to understanding raam naam tat saaraa that the name of the Lord, name of Waheguru, name of raam naam is the essencetat of the saaraa whole world. The only eternal thing in this world is the name of the Lord. khojat khojat khoj beechaari-o I have looked within my body, I have looked within my mind, within my soul, beechaari-o and I have come to this understanding raam naam tat saaraa that the name of the Lord is the essence of this body. That the eternal, immortal nectar within this body is the name of the Lord and that is the essence of this life, and that is the essence of this world. nimakh Even for an instant, even for a second if you are completely single minded centered upon the Guru's word and if you have araaDhi-aa remember the Guru, you meditate upon the Guru, the Waheguru even for a second kilbikh kaatay the greatest sins are kaatay, are cut away, are destroyed. gurmukh paar utaaraa If you center upon the Guru and meditate upon the Naam you will be paar utaaraa, you will be saved, you will be liberated. You will be carried across the ocean of this world, this ocean of fear. har ras peevhu purakh gi-aanee. O purakh, O being you consider yourself to be gi-aanee, gi-aanee means someone who has knowledge. If you consider yourself wise, if you consider yourself to have some sort of knowledge, and if you want to be a true gi-aanee, a true wisely and spiritual being, what do you have to do? har ras peevho, peevho means to drink the ras, the essence of har, Hari, of the name of the Lord. Just like we drink the worldly water with our mouths and it fills our stomachs and via the systems within us that water reaches all of our limbs, in the same way we are taught to take the name of the Lord, and it goes within us, within our souls and nourishes our mind, body and soul. har ras peevhu purakh gi-aanee O human being if you consider yourself to be a gi-aanee person with true wisdom then meditate upon the name of the Lord. sun sun mahaa taripat man paavai saaDhoo amrit baanee. rahaa-o. sun sun With your tongue meditate, with your ears listen. Guru Ji has said sun sun twice with praym and shardaa with true love and true devotion; and if you listen with these two qualities, mahaa taripat man paavai and your mind will paavai get greatest tripat, greatest satisfaction. tripat literally means the fires within you of desires will be put out. saaDhoo amrit baanee When you meditate upon the immortal words of the greatest saints, the Guru, the amrit baanee, the immortal nectar of the words, that will how you will find true satisfaction in this life. rahaa-o Satgur Ji says pause and think about this today. mukat bhugat jugat sach paa-ee-ai sarab sukhaa kaa daataa. You can find the jugat, the method of obtaining bhukat, bhugat means all worldly pleasures, and mukat means all liberation, sach the eternal truth, paa-ee-ai you can get. How? By meditating upon the name of the Lord. sarab sukhaa kaa daataa If you meditate upon the name of the Lord then you get sarab means all, sukhaa means all pleasures, all happiness, that happiness which is eternal. 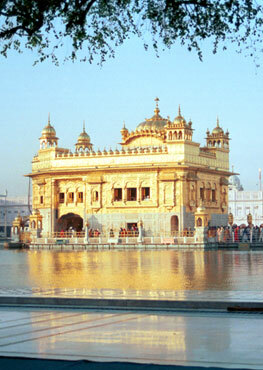 What does Waheguru do? Waheguru ji gives the daan gift of bhagtee of devotion of true love to his daas, to his slaves. pooran purakh biDhaataa Waheguru Ji is completely perfect, pooran purakh most perfect being, and biDhaataa creates all of our fortunes, all of our destinies. sarvanee sunee-ai rasnaa gaa-ee-ai hirdai Dhi-aa-ee-ai so-ee. If we ask Maharaj how we are meant to meditate, Maharaj Ji says with your rasna tongue, gaa-ee-ai sing the praises of the Lord but whilst you are doing this, sarvanee sunee-ai also listen with your ears. This applies to our Nitname, this applies to our kirtan and this applies to our katha. If you are singing then listen to the words you are singing, if you are doing or listening to the katha then listen to the words. hirdai Dhi-aa-ee-ai so-ee In this way you will Dhi-aa-ee-ai meditate with your hirdai, with your heart, so-ee that one Waheguru. By listening, by repeating, that Naam will go within you, into your heart. Waheguru is karan kaaran is cause of all causes, creator of all, samrath all powerful, all knowing, su-aamee our Lord, or Master. jaa tay baritha na ko-ee, baritha without Him, na ko-ee no other, and if you go to Him all of your pains will be taken away. vadai bhaag ratan janam paa-i-aa karahu kirpaa kirpaalaa. Maharaj Ji says with great bhaag fortune you have got the ratan the diamond of this janam of this human life. karahu kirpaa kirpaalaa Maharaj Ji is saying, Maharaj Sahib you have blessed me with this human life now please bless me with your name, karahu kirpaa kirpaalaa O kirpaalaa O Lord of all mercies, please bless me with this gift. You have given me this human life now bless me with the SaDh Sang, of your Naam. What gift is it? In the company of those saints, in the company of those, say-ee pi-aaray mayl jinnaa mili-aa tayraa naam chitt aavai We do this Ardaas every day. Please bless me with the company with whom I can recite your name. saaDhsang naanak gun gaavai Guru Maharaj Ji says may I live my life in the company of those who remind me of you O God. gun gaavai simrai sadaa gopaalaa, gun gaavai May I sing the praises of your virtues, simrai sadaa gopaalaa and may I forever meditate upon the gopaalaa, paalaa - means the nourisher, the creator, the go of this world. So Satgur Maharaj is doing this Ardaas in front of AkaalPurakh, Hay Akaalpurakh if you have given me this human life then please bless me with true love, praym for you, your saints and your name.